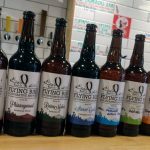 Well it’s been a pretty unquiet month at the Flying Bike, your local, member-owned co-operative brewery, where every beer you enjoy is guaranteed 100% locally sourced. It comes from over there in the corner, where there’s all those tanks and kegs and hoses. That’s pretty local. We’ve had the hops going on lately, among other things. That Equanot IPA held down the fort till the new El Dorado IPA arrived- both products of our room-dominating, multiply-named new double fermenter- while our Recusal Session IPA (it’s delicious, don’t neglect it) and nitro-pour Snowmelt Pale held steady. 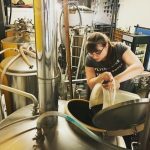 A couple of member-designed dark monsters that went away recently are coming back: Sarah Rood’s Coffee Milk Stout and Tony Ochsner’s Cascadia Dark Ale are both back in the works, by popular demand. And they just can’t get enough of Michael Jenkins’ Uncanny Valley Pale up there in the mountains, at the Snorting Elk Lodge at Crystal. We have some here, too. We’ll have to wait a while to see what results from that lager fermentation we managed to get going the other week. 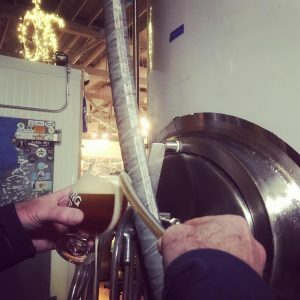 We call it a “malty lager,” because, well, it’s kind of like a Spring Bock, which isn’t really even a style, except with different malts, and too much hops, and the wrong yeast. Oops, we did it again. The Perfect Season Brown Ale, so named in honor our beloved beertender and Cleavelander Augustine, was down to the dregs and pretty much out of it going into February, fulfilling its inevitable destiny of falling just short of the Super Bowl. Substituting will be the Scotch Jensen Scottish Amber, brewed with a true Scottish yeast, and named for our dear Adjunct Professor. Speaking of whom, of course the month of February is really all about The Long Dark, Assistant Brewer Scott Jensen’s time to shine even more than always. For the juicy details, consult social media, or better, the awesome poster. As always in such matters, the head brewer maintains plausable deniability.